"One thing I appreciate about Tony Foster's playing, is its very fresh phrasing..he kind of strikes sparks from the piano with really inspired use of time that not many players seem to come by so easily." Tony Foster's CD is by far one of the highlights this season and is getting lots of plays! "Today I received the CD of Tony Foster and was very nicely surprised by Tony's great style and skills. For instance, what a great interpretation of The A' Train. This CD will be a treat to my listeners." "Tony Foster is awesome, I love his playing"
"As a debut record In between Moods by Tony Foster is a superlative trio recording. This is one of my favorites of 2009, it has a great feel, excellent musicianship, wonderful songs and that, oh… so nice to listen to mood." In Between Moods is the debut CD release by pianist Tony Foster, a trio recording in the style of the classic Oscar Peterson trio’s. The band includes bassist Russell Botten and drummer Joe Poole, fine accompanists with swinging energy. The nine song recording features four Tony Foster originals as well as two classic standards, the rest simply great jazz from the likes of Dado Moroni and John Clayton. Excerpt 2: The Tony Foster original compositions are a mix of styles, with “Colors Of Siena” sounding classical and tinged with European jazz influences. The tribute to Ahmad Jamal “Mr. J” is a fast swinging song that burns with energy and features Foster as a highly stylized pianist. The bluesy ballad “How I Miss The Rain” shows an understated style where time and space play against the rhythm and set the hip mood. The title track, “In Between Moods” features a catchy rhythm and dynamic playing. The drums and piano play off each other with exciting fills while the bassist creates a full and solid bottom end. READ the rest HERE ! "In Between Moods..deserves to be savored from beginning to end for this is one impressive album"
Originally from North Vancouver and currently based in the Seattle, Washington, Canadian pianist Tony Foster offers his debut trio recording with an ambitious repertoire of tunes that includes music from George and Ira Gershwin, John Clayton and Oscar Peterson among the mix of light jazz that features four sparkling originals. Along with bassist Russel Botten and drummer Joe Poole, the trio tackles Billy Strayhorn's classic “Take the A Train” in the opening track, inspired by the Ahmad Jamal arrangement of the tune, provides an upbeat perky rendition in contrast to the slow laid back style adopted by the Ellington band. Speaking of “perky,” wait till you sample Oscar Peterson's “Cakewalk” another lively piece of music that Foster admits was “CERTAINLY NOT a cakewalk to play! Excerpt 2: Pianist Tony Foster's trio recording debut of “In Between Moods,” deserves more than a listen it deserves to be savored from beginning to end for this is one impressive album of contemporary light jazz that tend to grab your attention. Foster and crew are simply marvelous here leaving quite an impression with their performance and hopefully, building a foundation for an encore performance in the future. 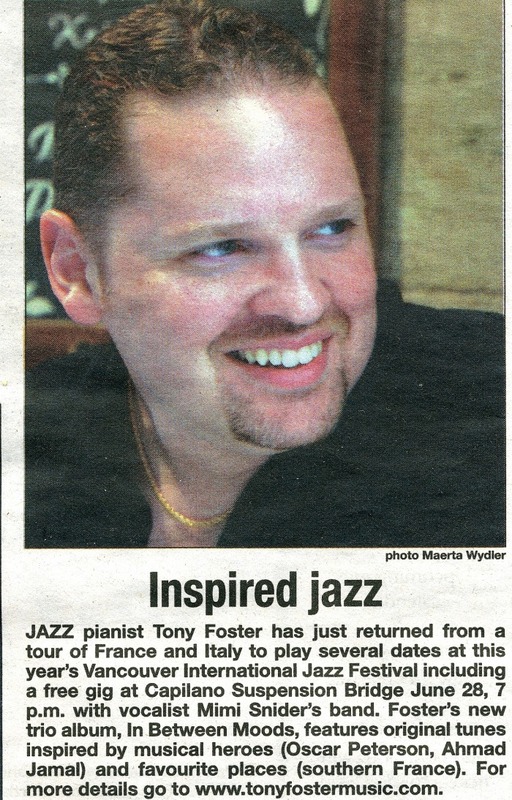 "Foster's approach to the keys..brilliantly blends the traditional with new directions"
In Between Moods, Tony Foster. I admire the chutzpah of pianist Tony Foster in starting off things with a version of "Take the 'A' Train." My admiration grows even more when the arrangement of Strayhorn's classic refurbishes the beloved old train into a bullet train, while still retaining the old charms. Hailing from the Pacific Northwest (Vancouver, B.C. & Seattle, WA) - where there is good jazz, that is unfortunately at times nearly elusive as the Bigfoot, Foster, drummer Joe Poole and bassist Russell Botten recorded all nine songs on In Between Moods live in different sessions for CBC Radio. Fans of Ahmad Jamal, Bill Evans, Oscar Peterson, Cedar Walton and Dave Brubeck will throughly enjoy Foster's approach to the keys, which brilliantly blends the traditional with new directions in a pleasing and harmonious manner. Poole and Botten are a powerful rhythm section, keeping the beat pumping on pieces like Oscar Peterson's "Cakewalk" and laying back on ballads like the Foster originals "Colors of Siena" and the waltzing "How I Miss the Rain" (only a Seattle resident would say it and mean it). This recording is already making serious waves on the radio charts in Canada and it deserves attention here in the U.S. for its impressive songs, playing and warm clear recording. Other highlights include the up-tempo originals "Mr. J" and the ever-shifting title track, along with a down-home, bluesy take on John Clayton's "Serious Grease." The clever integration of "Someone to Watch Over Me" (as solo piano) into a trio version of "You've Changed" (with the bass taking the melody) also should not be overlooked on this strong release, which hopefully will gain some recognition for this pianist from the rainy Northwest. "...Foster [ ] realizes both the importance and the impact of space"
In Between Moods, Tony Foster, piano. Here’s a Northwest guy, originally from Vancouver, B.C., now living in Seattle. So why in the heck didn’t I know of him before? From his opener, “Take the A Train,” you’ll discover that Foster, like one of his two piano heroes, Ahmad Jamal, realizes both the importance and the impact of space. His sparse approach gives a totally new look to the old standard. Having plowed ground under the shadow of Jamal, Foster then does a 180 and plays “Cakewalk,” a joyous romp composed by his other hero, Oscar Peterson. Needless to say, Peterson and Jamal are worlds apart, but Foster does ‘em both with ease and flair, all the while not sounding like either of them. Some shades of color and texture follow on several Foster originals, and he ends the program with a medley of “Someone to Watch Over Me” and “You’ve Changed,” followed by the closer, a down-home John Clayton blues called “Serious Grease.” Foster’s playing mates, both sharpshooters, are Russell Botten, bass, and Joe Poole, drums. Foster’s got a lot going for him, and somebody needs to invite him to travel the short 175 miles to play here in Portland. Vancouver pianist Tony Foster left university with a degree in commerce, but the Muse had other ideas. A favourite sideman of vocalist Dee Daniels, Foster has just released, through tonyfostermusic.com, an excellent nine-track trio record in the company of bassist Russell Botten and drummer Joe Poole. When Tony Foster took the stage in a French village outside Nice he wasn't sure what to expect. 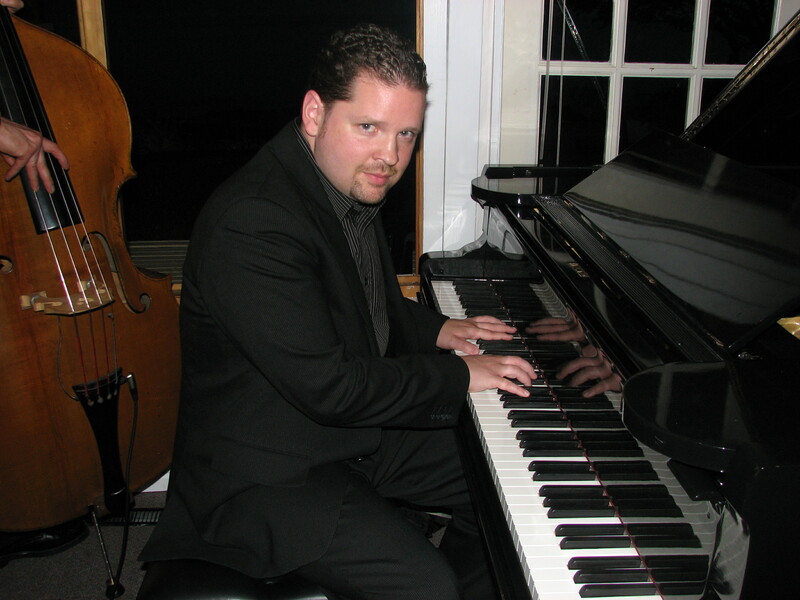 The North Vancouver jazz pianist and composer had won a competition and this was his prize, the opportunity to play a concert in Coaraze, a small town in the hills of France. Click HERE for the whole story. It wasn’t supposed to happen. Tony Foster’s world was full of numbers, equations and calculus. The Carson Graham secondary school graduate was well on his way to a business career, having completed University of British Columbia’s commerce program. Click HERE for the whole story. 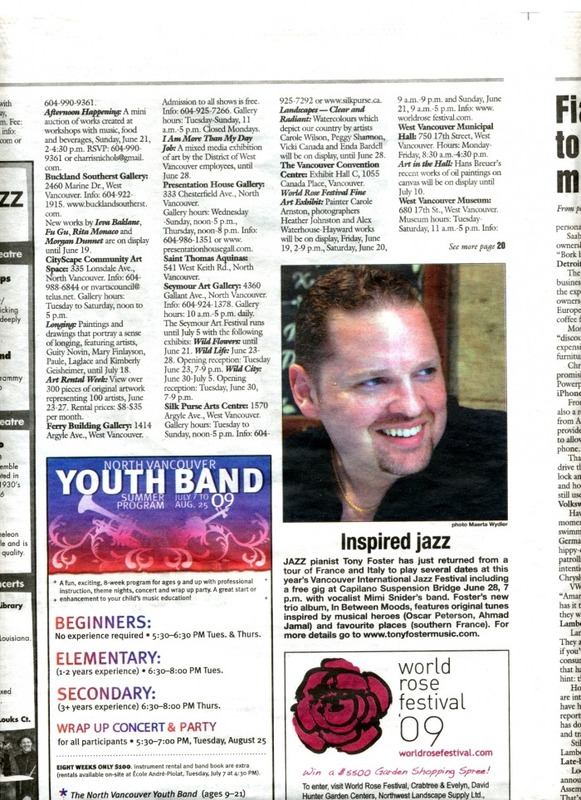 excerpt promo for Vancouver Jazz Festival performances and In Between Moods CD release.